Zakir Hussain learned from the best — his father, Allah Rakha, was a tabla legend. But Hussain's career really took off when he started working with the rock musicians he grew up admiring. All this week, Morning Edition is talking about drums and drummers. For the fourth installment in "Beat Week," David Greene spoke with a master of an ancient tradition who has played with some of the world's most famous musicians. 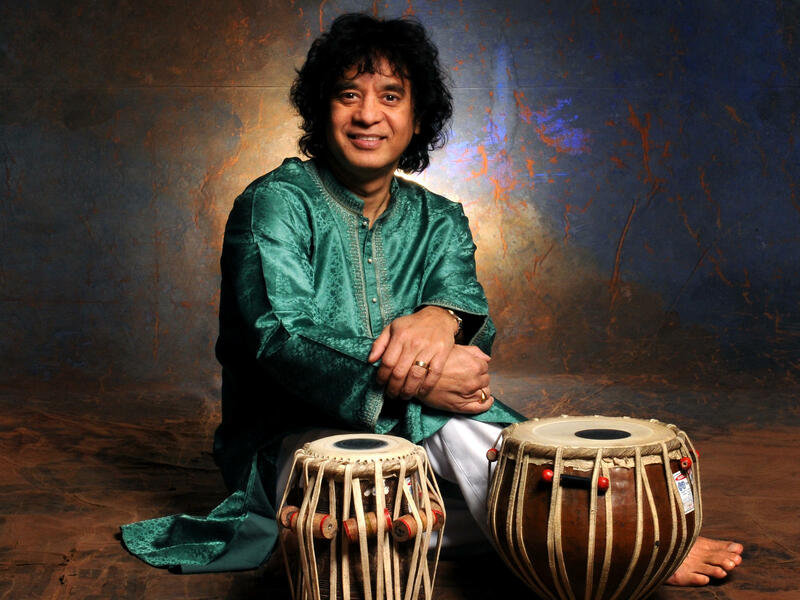 Zakir Hussain can pinpoint the beginning of his musical life. It began one day in India in 1951, when he was 2 days old. "I was brought home from the hospital. The tradition is that the son is handed to the father, and then the father has to recite a prayer in his son's ear, putting him on his way," Hussain says. "My father, when he took me in his arm, instead of reciting prayer, he sang rhythms in my ear. And my mother was very upset and said, 'Why are you doing this?' And he said, 'Because this is my prayer.' "
The prayer was that his son would carry on his legacy as an Indian classical musician. Alla Rakha, the father, is considered one of the world's greatest players of the tabla, a centuries-old Indian hand drum. Zakir Hussain has carried on that tradition — not only as one of the world's foremost Indian percussionists, but also as one of the architects of modern world music. He has broken down barriers and brought together musicians from all different cultures. "I was woken up at 2:30 in the morning, and that's when we sat and talked rhythm," he says. "And he told me about the history of our tradition and the great masters of the past, and what it all is — just kind of developing inside me the whole idea of existing in this world." "It didn't matter to me; I was so happy. To be in his presence was great," he says. "From about 2:30 on, he talked to me, and then at 6:30 I would go to the local Islamic school, the madrassa, and learn to recite the Quran. When that was over, I'd go across the street into my school, which was a Catholic school, and we'd sing the hymns and then go to class." He adds, "Doing all of that in the space of, like, five-and-a-half or six hours, I was a very confused child." But Hussain's mind was opened to new things — including the music his dad would bring home from his world tours. He says he was the only kid on his block who would walk around with a boombox on his shoulder, blasting rock songs like The Doors' "Light My Fire." Hussain even considered swapping his tablas for a drum set at one point. He wanted to be a rock star — until an actual rock star set him straight. In the 1960s, Western musicians were becoming interested in Indian music, and Hussain found himself working on a sitar record with George Harrison. He told the Beatle about his dream to get into rock. "And he said, 'Well, look. You want to play drums and all, but the reason why you're sitting next to me is because you represent a culture that I really adore, and that's what you bring to this table,' " Hussain says. Harrison reminded Hussain that his competition in the rock world was stiff. " 'And if you want to be just one of the thousand and be somebody that you are not, that's entirely up to you. But if you want to take all these incredible [drummers] — Elvin Jones or Tony Williams or Ringo and everybody — and make that part of your music, just imagine how unique your music will be.' And it made total sense." Zakir Hussain stuck with the tabla and built a career, playing classical music but also experimenting with the instrument. He landed in San Francisco at the height of the hippie era, and became a fixture of the marathon jam sessions held by The Grateful Dead at the band's barn-turned-studio. "The shortest one was probably 2 1/2 days long — I'm not kidding," Hussain says. "But I do remember ... waking up sleeping on the floor, and looking up and seeing Jerry Garcia and David Crosby playing. And I'd just kind of rub my eyes and pick up a drum, which was just lying on the floor, and start playing. This was a constant thing. It was a never-ending musical conversation." Hussain and Dead drummer Mickey Hart have now been collaborating for four decades, and still perform together today. More recently, he began working with American banjo legend Bela Fleck. Hussain says that all of these collaborations over the years have been humbling. "You know, you come from India and you say, 'OK, I'm representing a 3,000-year-old history,' so you think you're gonna teach the world about rhythms and drums and so on," he says. "And then you arrive here. You suddenly realize that you know nothing. You're just one little dot in the painting that is the music of the universe." This morning, our colleague David Greene introduces us to a master of an ancient tradition. He's played with some of the world's most famous musicians. DAVID GREENE, BYLINE: His name is Zakir Hussain, and he's playing the tabla. It's a centuries-old hand drum from India. But to really understand Zakir's story, listen here to his voice. ZAKIR HUSSAIN: (Singing drum rhythm). GREENE: Because it was a voice of that gave him the gift of drumming when he was two days old in India in 1951. HUSSAIN: I was brought home from the hospital. The tradition is that the son is handed to the father. And then father has to recite a prayer, putting him on his way. So, my father, when he took me in his arm, instead of reciting prayer, he sang rhythms in my ear. And my mother was very upset and said, why are you doing this? And he said, because this is my prayer. GREENE: The prayer was that his son would carry on his legacy as a classical Indian musician. Allah Rakha, the father, is considered one of the world's greatest tabla performers. And his son, Zakir, has carried on his late father's tradition, not only as one of the world's foremost Indian percussionists but also one of the architects of modern world music. Zakir remembers being 7 years old when his father first approached him and asked if he was ready to learn the tabla for real. The lessons were to begin in the middle of the night. HUSSAIN: I was woken up at 2:30 in the morning, and that's when we sat and talk rhythm. And he told me about the history of our tradition and the great masters of the past and what it all is. HUSSAIN: Just kind of developing inside me the whole idea of existing in this world. GREENE: Was this every night? HUSSAIN: Every night for four years. HUSSAIN: It didn't matter to me. I was so happy to be in his presence - was great. So from about 2:30 on until about 5:00, 5:30, he talked to me. And then at 6:30, I would go to the local Islamic school, the madrasa, and learn to recite the Koran. And then, when that was over, go across the street into my school which was a Catholic school. Doing all that in the space of, like, five and a half or six hours, I was a very confused child. GREENE: But he was being exposed to so much. And his mind was open to new things, including the music his dad would bring home from his world tours. HUSSAIN: I was the only kid on the block who was walking down the street with a boombox on my shoulder, playing as loud as I could "Light My Fire." THE DOORS: (Singing) Try to set the night on fire. GREENE: Zakir even considered swapping his tablas for a drum set at one point. He wanted to be a rock star until an actual rock star set him straight. Western musicians were becoming interested in Indian music, and Zakir found himself working on a sitar record with the Beatle George Harrison. GREENE: Zakir told Harrison about his dream to get into rock. HUSSAIN: And he said, well, look, you know, you want to play drums and all. But the reason why you're sitting next to me is because you represent a culture that I really adore. And that's what you bring to this table. I have 500 drummers at my beck and call. And if you want to be just one of the thousand and be somebody that you are not, that's entirely up to you. But if you want to take all this incredible Elvin Jones or Tony Williams or Ringo and everybody, and you make that part of your music, just imagine how unique your music would be. And it made total sense. GREENE: Zakir Hussein stuck with the tabla and built a career playing classical music but also experimenting with the instrument. He landed in San Francisco at the height of the hippie era. Here was this classical Indian musician at jam sessions with the Grateful Dead. GREENE: Well, how crazy did some of these jam sessions get? I mean, I assume there were some drugs. There was some all-night stuff going on? HUSSAIN: The shortest one was probably about two and a half days long. GREENE: I'm not going to ask what kept people going through all those hours and hours. HUSSAIN: And looking up and seeing Jerry Garcia and David Crosby playing. And I just kind of rubbed my eyes and pick up a drum which was just lying on the floor and start playing. This was a constant thing. It was a never-ending musical conversation. GREENE: So I'm sure deadheads recognize Jerry Garcia's playing there. GREENE: And this is a track that would actually evolve into a really famous Grateful Dead song, "Fire On The Mountain," right? HUSSAIN: Exactly. It started with that bass part. (Singing) Boom boo boop boop boo boom boop boo dah dee boo doo boo boop boop. GRATEFUL DEAD: (Singing) Fire. Fire on the mountain. GREENE: Zakir and Grateful Dead drummer Mickey Hart have now been collaborating for four decades, and they still perform together. Zakir's also been working with American banjo legend Bela Fleck. This is what the tabla and the banjo sound like together. GREENE: Zakir says all of these collaborations over the years have been humbling. HUSSAIN: You know, when you come from India, and you say, OK, I'm representing a 3,000-year-old history. And so you think that you're the one who are the teacher of the world. And you're going to teach the world about rhythms and drums and so on. And then you arrive here. You suddenly realize that you know nothing. You're just one little dot in the painting that is the music of the universe. GREENE: Were there ever any moments when you thought back to those nights with your father at 2:30 in the morning and then sort of thought about what you were playing now and all this experimental stuff, and there was a contradiction? You were, like, what am I doing? What about the traditional stuff that I learned as a kid? HUSSAIN: Having learned from my father the way of life as a rhythmist and seeing that same way of life being practiced all over the globe by other rhythm players and knowing that we were all on the same wavelength, the same quest, looking for perfection, which we will never find. But that didn't matter because it's all about the journey - not the goal. GREENE: Zakir Hussain, it has been a real pleasure. Thanks so much for talking to us. HUSSAIN: It is my pleasure, David. Transcript provided by NPR, Copyright NPR.